Carlton Cole has been fined £20,000 by the Football Association for comments he made on Twitter during England's friendly with Ghana. 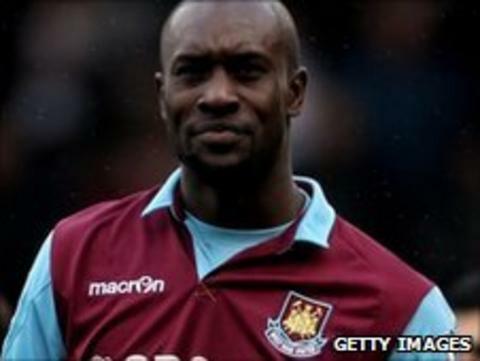 The West Ham striker admitted a charge of improper conduct over the messages to more than 45,000 followers. "Immigration has surrounded the Wembley premises! I knew it was a trap!" he wrote, before deleting the comments. "The only way to get out safely is to wear an England jersey and paint your face w/ the St George's flag!" The England international, who won his last cap in March 2010, responded on the social networking site on Thursday: "I will be asking to donate the money to a Ghanian charity of my choice, preferably to a children's charity. "Sorry if i have offended anyone but there was no malice & harm meant. I never knew a light hearted joke would cause so much offence." Cole was represented at his FA hearing by the Professional Footballers' Association, which has reminded its members that the website was "not an intimate private conversation" - but questioned the severity of punishment in such cases. "It is ironic that at a time when players are accused of being distant and out of touch with supporters that attempts to communicate can bear such potential sanctions," said deputy chief executive Bobby Barnes. Cole's reprimand is the latest in a number of incidents regarding Twitter that the FA has felt the need to investigate. In January, Dutch winger Ryan Babel was fined £10,000 and warned about his future conduct by the FA over a post he made on Twitter. Babel, who was a Liverpool player at the time, linked to a mocked-up picture of referee Howard Webb in a Manchester United shirt in reference to the official awarding a penalty to the home side and sending off visiting captain Steven Gerrard in Liverpool's 1-0 FA Cup defeat at Old Trafford. In February, Arsenal's Jack Wilshere escaped punishment after tweeting about referee Phil Dowd following his side's 4-4 draw with Newcastle. The FA looked into the matter but stopped short of punishing the midfielder. During last year's World Cup in South Africa, England's players were banned from posting comments on Twitter or Facebook or writing articles for newspapers for the duration of the tournament. Read more on Twitter ye not?